The lovely Susan at Isabella Golightly recieved her package in the mail yesterday, so I can post photos here! I asked her what colours she liked and wheather she preferred sewing or knitting. Her reply was I probably lean towards blues and greens for colours, the jewel colours…Knitting v sewing – that’s a real toughie for me, I love both of those things, but it’s summer now, so I’d have to say “sewn”. Way to hot to be asking anybody to knit for me! I had been planning to knit her something, so Susan choosing sewing threw me a little, but I am always up for a challenge. I thought about it for a little while, and did a little snooping on her blog and her etsy and decided to make her a bird. I started on an idea, but wasn’t happy with it, so abandoned it halfway through and tried again. This time I was much happier with the result! Blue, green and jewel colours. What other kind of bird could you make but a peacock? I was really lucky in the material I found for the body. That had the perfect blue sheen to it for peacock feathers. 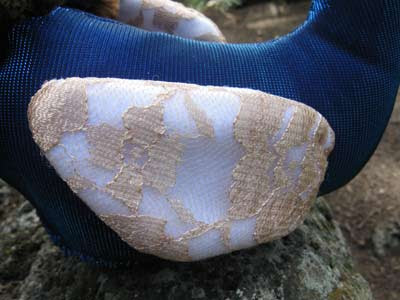 It was only a netting though, so underneath is blue felt. Same with the wings. If you look at peacock wings, they’re brown and white. Since I was going with the netting and felt option for the body, I figured I’d continue that theme in the wings. This time it’s beige lace over white felt. 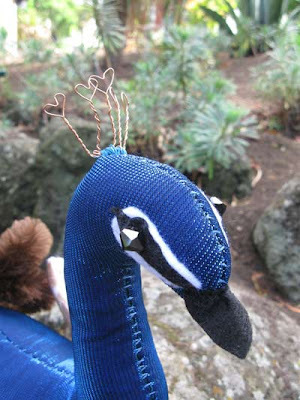 Every peacock has a crown, this one’s crown is made from copper wire and is in th shape of little hearts. 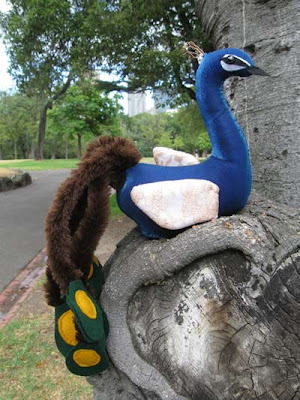 I have to admit that I was sewing this peacock at work, where there was no access to the internet and I had this nagging doubt that because this was a swap for Febuarury, that it was in some way supposed to be about love, or hearts, or something. But I wasn’t sure. So I made the crown like this, to hedge my bets each way. Nicely enough, the eyes are beads from my found broken jewellery collection. Overall, I was really happy with the results of this little guy, and I’m thrilled that Susan liked him so much!